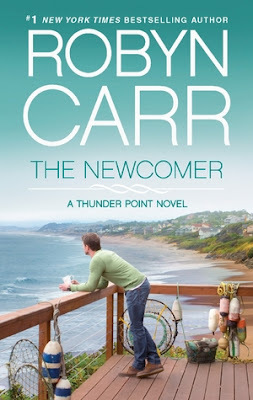 I'm crazy over Robyn Carr's new series Thunder Point. It has everything I need for a good romance story. Yet, so much more. She's not just telling one story here. There are several all woven together. Usually with stories like this I'm left hating when it turns away from my favorite couple to talk about a different couple/story but not here. I am invested in every single character and their stories. That is good writing folks! The setting takes place just as the cover suggests. On the beach. I love beach towns. They are so quaint and the locals are so chill. It is the same in Thunder Point. I can picture it all and I just want to go there. Mac and Gina have finally got their relationship going when Mac's ex wife shows up after 10 years and starts some trouble. There is a lot going on in this story with all the character's. Everyone has some big news or some huge event happen to them. Yet, they are probably something we've all gone through or can at least sympathize with. It's life. I enjoyed seeing how they all overcame their trials. If you enjoy adult romance then look no further. Author Robyn Carr is the real deal. This new series is everything I love about romance. The Newcomer is fantastic! I'm just dying for the next book!